Kale is the crowned queen of green leafy vegetables because its nutritional value and health benefits almost make it a superfood. Its history can be traced back to 20th century BC where it originated in the eastern Mediterranean region. Pronounced K-E-I-L, this leaf cabbage belongs to the botanical family of Brassica oleracea and is considered to be a close cousin of wild cabbage, but unlike cabbage kale does not form a head in the central leaves. Kale acquired a superstar status on our menu only as late as 2012. Today, it is a must have in every Michelin-starred restaurant, health food blog or in healthy domestic kitchens. Rich In Anti-oxidant:Anti-oxidants are important for scavenging the free radicals that cause a metabolic problem called oxidative stress. Kale has two prominent antioxidant carotenoids. Dietary carotenoids are proven to provide protection against certain cancers and degenerative eye problems. Carotenoids protect plants against photo oxidative processes; in the human body they are a part of the antioxidant system. Beta Carotene. Out of a large number of carotenoids, beta carotene is the most usable by our body. Beta carotene is thought to increase the production of glutathione – our body’s master antioxidant, and an essential part of our natural defence system. In addition, beta carotene is a free radical fighting antioxidant on its own. Lutein: Also called the eye vitamin, Lutein is an important ingredient that protects our eyes. Lutein helps the eyes from free radical damage caused by blue light and sun exposure. It also works to prevent or delay cataracts, keeping the lens clean. Fights Inflammation:Inflammation is your immune system’s reaction to irritation, injury, or infection. It’s a normal response but when it becomes chronic, it leads to a number of health problems. Omega 3 present in good quantities in kale. Omega 3 poly unsaturated fats are well researched for their anti-inflammatory properties and have been found to be beneficial for arthritis, asthma and autoimmune disorders. Vitamin K is another potent anti-inflammatory agent present in most green leafy vegetables. This vitamin has been found to be an effective anti-inflammatory agent in several studies. It is known to supress the production of pro-inflammatory cytokines. Vitamin C helps the body get rid of free radicals that damage cells and tissues leading to inflammatory responses. Vitamin C may also be effective in lowering C-proteins. Flavonoids are linked to a decreased risk of cancer in a number of epidemiological studies. Quercetin, a flavonoid present in kale, is associated with a reduced the risk of lung cancer and another flavonoid of kale – kaempferol is found to be protective against stomach cancer. The huge amounts of flavonoids in kale all add up to its cancer protective properties. Glucosinolates found in all cruciferous vegetables are capable of stopping cancer growth in its tracks. These sulphur containing compounds are broken down while chewing, chopping and digestion into active compounds like indoles, thiocyanates and isothiocyanates. These work by inactivation of carcinogens, protection against DNA damage, induce cell death (apoptosis), inhibit tumour blood vessel formation and inhibit tumour cell migration. 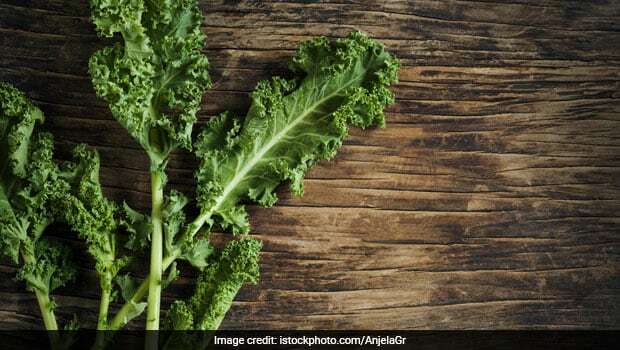 If this was not enough reasons for you to include this amazingly nutritious vegetable in your diet, then you must know that kale has many other health benefits like promotes heart health, helps in brain development and prevention of birth defects. Kale is quite a versatile vegetable with multiple health benefits. You may include this wonder veggie in your meals or add it to your smoothie. The nutritional value of kale is very high, which means that you must include this vegetable in your diet.